At the end of the school year in 1959, May Sipe, a second grade teacher for 36 years, retired. In September 1959, she started the Delaware County Chapter of the Ohio Retired Teachers Association. Under her leadership for the next four years the chapter became an active and well-knitted organization.The Delaware County Chapter members participate in local activities and support the efforts of the state organization. 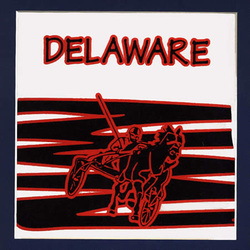 The Delaware County Chapter (DCRTA) meets four times a year, usually on the second Friday of the months of March, June, September and December. There is a luncheon, business meeting and program. Opportunity for camaraderie and for keeping abreast of educational trends occurs throughout the time. The quilt square represents The Little Brown Jug, a premier pacing classic for three-year olds. The Jug is held every year in September as part of the Delaware County Fair.